Christian Beitel ’13’s time at Dickinson has been full to the point of overflowing. In just three years he has played on two Centennial Conference champion lacrosse teams, completed a semester abroad and a summer-long independent study on Dickinson’s global education efforts in Málaga, Spain, and completed the first section of the Marine Corps Platoon Leaders Course—all while double majoring in international studies and Spanish. “If you want something, go and get it,” Beitel says. 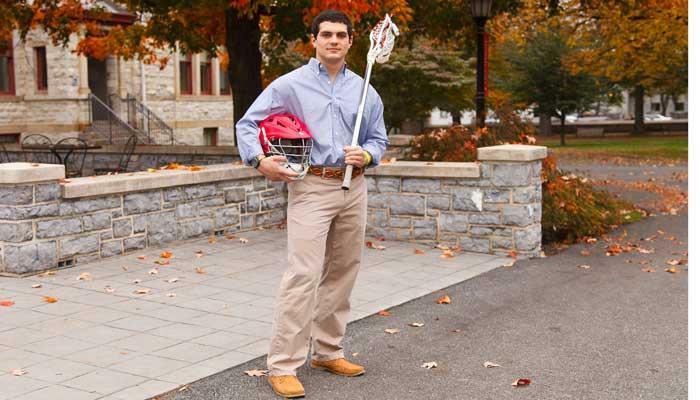 “Dickinson has shown me I can do that.” Beitel was attracted to Dickinson because it offered him the chance to play lacrosse while still having the chance to study abroad and benefit from a useful liberal-arts education in a small, close-knit community. But he knew that the price tag presented a daunting challenge. Thanks to generous scholarship donors, Beitel didn’t have to guess. He received sufficient financial aid to come to Dickinson, where he has been able to study international relations and gain fluency in Spanish—not only through small classes but also by living in Málaga, interacting daily with its people and coming to love and respect its rich cultural history. Poised to graduate this spring, Beitel eyes the future with confidence. He’s considering completing his officer training to become a second lieutenant in the Marines or looking into teaching and coaching opportunities. Whatever he does, Beitel knows he wants his work to make a difference—and he knows scholarship donors have already made a significant difference in his life.